FCEDA’s Asher Kotz explains why Fairfax County is the ideal place to be located. Nearly 70 government officials and business leaders gathered for an informational and networking conference March 28 at FCEDA headquarters in Tysons, where the Virginia Manufacturers Association and Manufacturers Association of Israel signed a memorandum of understanding to strengthen business ties. Given its longtime association with the Israel business community, it was only natural that the Fairfax County Economic Development Authority — which has maintained offices in Tel Aviv since 2004 — served as the meeting spot for the MOU ceremony and the Virginia Israel Defense Contractors Teaming Event, presented by the Virginia Israel Advisory Board. Featured speakers included Brian Ball, secretary of commerce and trade for the Commonwealth of Virginia, Tom Scott from the Virginia Economic Development Partnership and Paul Friedberg from the Israel Ministry of Defense. But the real stars were the companies from Virginia and Israel who met during one-on-one networking sessions to discuss the mutual benefits of collaboration. Take for example the team from Aharon Yosef and Sons Electronic Packaging Industries, known for their metal fabrication products for more than 60 years. A third-generation operation with two locations in Israel, Shlomi Aharon said that the company was founded by his grandfather, a Holocaust survivor, who gained metal fabrication experience by in the Auschwitz workshop by making metal lunch boxes for Nazi soldiers. Today, the company not only handles metal fabrication but assembles complex systems for commercial industry and missile launchers for Israeli customers. It works with international companies including Raytheon, Siemens and Bombardier. On the flip side, Richard Owen, director of business development for ADI Technologies in Chantilly, attended with sights set on making a match. Owen says ADI chooses to be located in and to showcase Fairfax County for a reason. Israel is about one-fifth the size of Virginia with a slightly larger population (about 9 million to Virginia’s 8.4 million). Given the challenges it faces in the Middle East, Israel spends $21.6 billion annually on defense, the 14th highest expenditure of any nation. Consequently, many of its industries mesh with the innovative technologies being applied in Fairfax County and in Virginia, notably in the fields of aerospace, defense, electronics and cybersecurity. 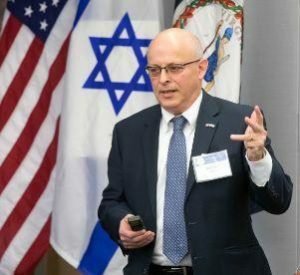 “The Virginia Israel Advisory Board leverages the strong synergies between Virginia and Israeli businesses, particularly in manufacturing, maritime and military-related industries, with the goals of increasing direct foreign investment in Virginia, bilateral trade and developing lasting partnerships,” said Dov Hoch, the advisory board’s executive director. It was Hoch who seized on an invitation from Gov. Ralph Northam to work on enhancing commercial ties between Virginia and Israel. He worked in concert with the FCEDA’s Asher Kotz, business development manager for Israel and cybersecurity, to organize the event. “Our goal is to attract international companies,” said Kotz, noting that the FCEDA also maintains offices in Bangalore/Mumbai, Berlin, London, Los Angeles and Seoul. In addition to Fairfax County’s access to U.S. markets and the federal government, its highly-skilled worked and exceptional quality of life, Kotz pointed out that it is also home to a “vibrant Israeli and Jewish community,” not to mention more than 30 Israel-based companies. Representing the Commonwealth, Ball cited Virginia’s pro-business environment and a new focus on workforce training and development. Among business leaders from companies that included Northrop Grumman, Huntington Ingalls, Baker Tilly and the Williams Mullen law firm, was Duane Baker, business development analyst for Lockheed Martin. Baker explained that Virginia is a land of opportunity for international manufacturers who want to become part of the supply chain for government agencies and large companies like Lockheed Martin. “We have a huge need for suppliers of everything — from paperclips to pieces of airplanes,” he said.